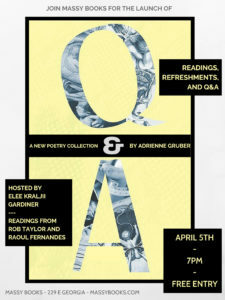 Join Massy Books for the launch of Adrienne Gruber’s new poetry collection – Q&A! And featuring a Q & A! Adrienne Gruber’s third full poetry collection, Q & A, is a poetic memoir detailing a first pregnancy, birth and early postpartum period. The poet is both traumatized and transformed by the birth of her daughter. She is compelled by the dark places birth takes her and as she examines and revisits those places, a grotesque history of the treatment of pregnant and birthing women reveals itself. Adrienne Gruber is the author of two books of poetry, Buoyancy Control (Bookhug) and This is the Nightmare (Thistledown Press), and five chapbooks. She won The Antigonish Review’s Great Blue Heron poetry contest in 2015, SubTerrain’s Lush Triumphant poetry contest in 2017 and has been shortlisted for the CBC Literary Awards. In 2012, her chapbook, Mimic was awarded the bpNichol Chapbook Award. Originally from Saskatoon, Adrienne lives in Vancouver with her partner and two daughters. Q & A is her third book. also the editor of What the Poets Are Doing: Canadian Poets in Conversation (Nightwood Editions, 2018) and guest editor of the 2019 edition of The Best Canadian Poetry in English (Biblioasis, 2019). In 2015 Rob received the City of Vancouver’s Mayor’s Arts Award for the Literary Arts, as an emerging artist. He lives in Port Moody, BC with his wife and son. Raoul Fernandes lives and writes in Vancouver, with his wife and two sons. He first collection of poems, Transmitter and Receiver (Nightwood Editions, 2015) won the Dorothy Livesay Award and the Debut-litzer Award for Poetry in 2016 and was a finalist for the Gerald Lampert Memorial Award and the Canadian Authors Association Award for Poetry. He has been published in numerous literary journals and anthologies, including The Best of the Best Canadian Poetry in English. Elee Kraljii Gardiner is the author of Trauma Head and serpentine loop, and the editor of the anthologies V6A: Writing from Vancouver’s Downtown Eastside and Against Death: 35 Essays on Living. This event is taking place on the unceded territories of the Musqueam, Squamish and Tseil-Waututh Nations. Please feel free to reach out with any inquiries. The event is all-ages, but we will have beer and wine available for purchase.